Given the broad range of different applications to which they are put, electronic casings must comply with specific design and functional requirements. In addition to the miniature aluminium casings which are already part of their range, Fischer Elektronik supplies a profiled version for non-standard PCBs with a width of 55mm. 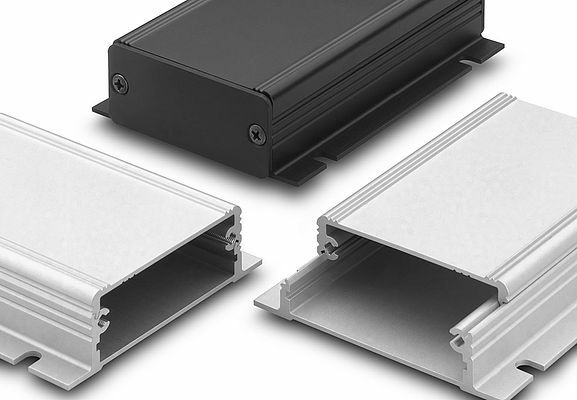 The newly developed, lower half-shell aluminium profiles come with integral mounting brackets, which allow the user to fasten the aluminium miniature casings to walls or ceilings. In the standard version, these casings are available in three different lengths (50mm, 80mm and 100mm) and with two surface finishes. In addition to these standard versions, modified versions of the casings can be made to suit customers' specifications. They include different mechanical processing operations such as milling and cutouts, surface treatments like blasting and grinding, inscriptions using screen printing, under eloxal printing or laser technology.